Yesterday, as we were settling into dinner, Katie Reed of FarmMaid Foods knocked on the door to tell us about a colony of bees that had swarmed in Provincetown. She knows we are beekeepers (no matter our track record at keeping them alive…) and thought we might be interested in capturing a swarm hanging up on a tree limb. After taking a mental inventory–can we take on more bees? We just got our two hives from Vermont the other week…Did we have enough supplies to add another hive–bee boxes, frames, etc.–we quickly ate dinner, and dispersed. Katie back to Provincetown to meet us there, and John, Debbie and I up to the farm to collect a limb cutter, trash barrel, ladder, a Nuc to place the bees in, beekeeper’s gloves, a brush and a smoker. We weren’t sure how large the swarm was. The last time John, Debbie, and Tessa collected a swarm, it was quite large (and heavy) and fit nicely into a large trash barrel. That hive did not end up surviving through the winter however, as it was collected in July and the bees did not have enough time to settle into their new home and make enough reserves for the winter lay over in the hive (now the poem makes sense). Collecting a Swarm is not a terrifying experience. Contrary to the image of a swarm of bees as dangerous and vicious, swarms are actually docile, creating a mass like a school of fish, one be on top of the other, with their sacred Queen in the center. They have no young or food supplies to protect and their pheromones are attracting them towards the queen. She is their number one; nothing else matters. None of us were stung despite handling and abruptly moving the limb on which the swarm had perched. Personally, I got right up close to the bees to both record them and to move the nuc we had collected them in. I didn’t wear gloves or any protective gear and felt unthreatened by the possibility of stings. When John mentioned the Epinephrine Pen, I took it as a joke. I’ve come to take most of what he says as a joke or sarcasm of some sort, so when he stood high on the ladder, Swarm Limb in hand, asking if anyone had an EpiPen, I thought he was making a funny about being allergic. In reality, he was addressing the possibility that the swarm could become agitated enough to strike out and if that was the case, anyone would need an EpiPen as the venom would be so concentrated. This “ball” is a solid mass of bees, the queen safely in the middle somewhere–warm and protected. While we were taking the swarm down and putting it in the nuc, bees continues to show up, most likely the scouts who had gone out to find a new home in some sort of cavernous space. 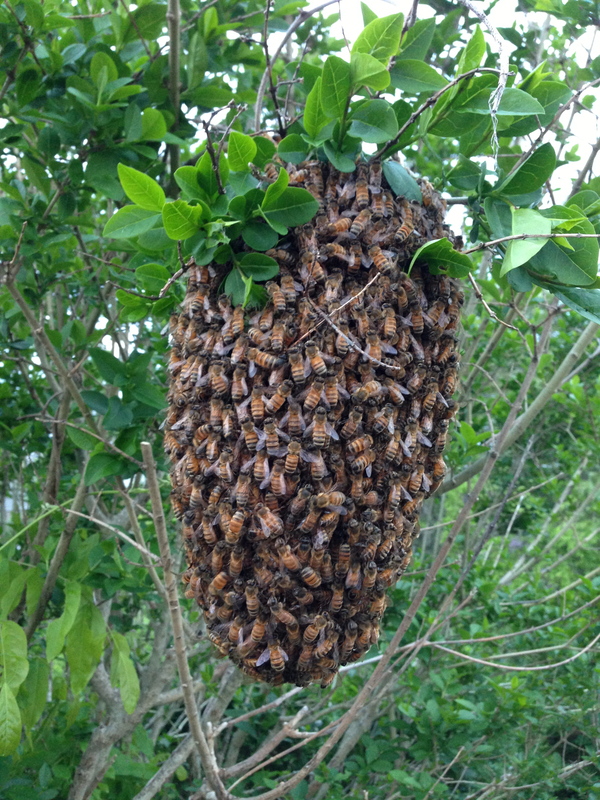 Bees swarm usually in the late spring or early summer for a number of reasons including overcrowding or having an old tired queen. A swarm is an attempt at a revamping of a colony; cleaning house by leaving it behind. We have no idea at this point if our swarm has a queen or not. Tomorrow, Debbie and I will take a look for her when we move the bees from the nuc into a proper bee box (good thing we have an extra!!). If there is no queen, we will have to order one quickly. There is someone on Cape who produces queens, however it may be too late to get one from them. Later that night, we were watching the new season of Arrested Development together. It was perfect. At one point, Gob drove up in a limo saying “I’m not a limo driver, I’m a gentleman bee keeper.” George Sr., not hearing what he said, opens the back doors of the limo and thousands of angry bees exit, sending everyone in the vicinity into a panic. This is what most people think of when they think of a swarm. I’m glad I get to envision something different. No one bought our cut herbs, probably thinking they were a flower arrangement of some sort or else just overwhelmed by the amount. Next week, we will try bundling herbs for simple selection. Also next week, we have got to remember some bug repellent. The mosquitos were biting hard. Even Diesel was annoyed by them. The acorns are sprouting all over the farm! Thanks, but we have enough trees at the moment little acornies. Stay tuned for a long article about our bees, their trip to our farm and why we have got to do our best to become the best beekeepers we can be. 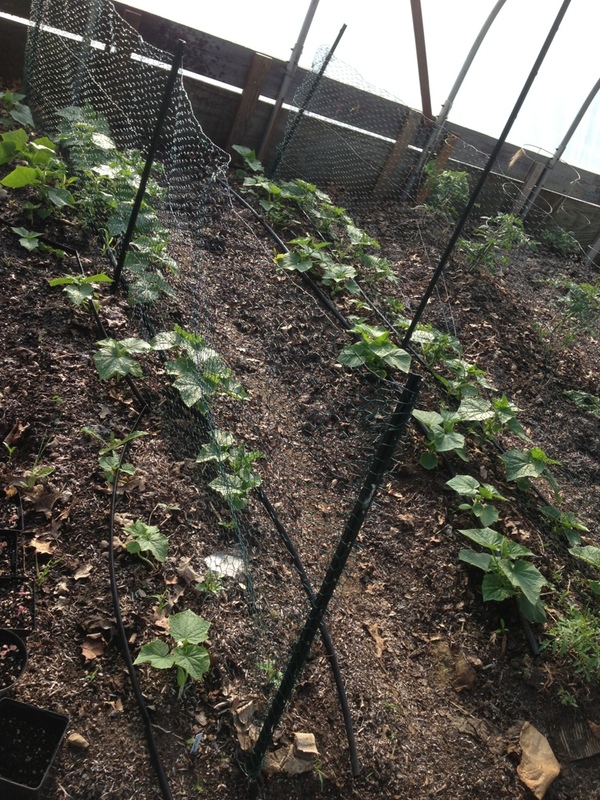 Look at our cucumbers coming up strong! !